As most of you know, the Blogville Pawlympics is this August. What you might not know (even though I've announced it 87 times...BOL!) is that the deadline to enter Pawlympics events is July 15th! So, if you're going to host or enter an event, please click here for more info! 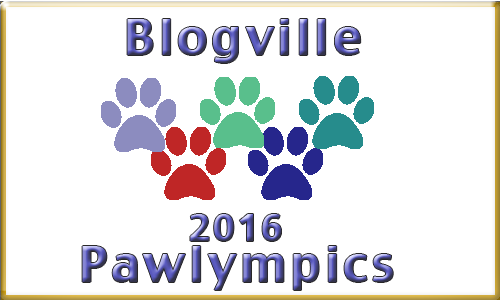 The link will take you to the official Pawlympics post I made back in May. You could also shoot me an email at submissions@pawprovince.com if you have any questions or if you're choosing to host an event. I'll be hosting Channel Surfing! Oh, and here's a cool badge you could add to your sidebar if you like. Oh, you're gonna have to keep reminding - it's the nature of the beast! We don't have any photos for your event but hope to get some before the dead lion! We NEED to get her moving! You will LEARN that REMINDERS are like good FURENDS... you can't have Enough of them. Sounds really exciting!! We'll ask our mom to enter an event!! I will post my rteminder tomorrow too... I can't wait to see all that cool events! We always appreciate reminders!! Sometimes mama gets so busy she actually forgets to send in the entries! I think we've entered every single event we can. Momma's going to double-check her list this week to make sure!